In the North Indian Ocean: Tropical cyclone (tc) 02a (Mekunu), located approximately 555 nm south-southwest of Masirah Island, is tracking north-northwestward at 04 knots. India – Six people died and almost 18,000 are living in relief camps after flash floods triggered mudslides in Tripura. Parts of the state capital Agartala and outskirts of West Tripura, Khowai, Gomati and Sepahijala districts have been submerged. Somalia – At least six people died and hundreds of homes were destroyed following heavy rainfall and flooding in Mogadishu, the capital city of Somalia. Sweden – Few would complain about the warmer weather Sweden is basking in these days, but in some parts of the country it has caused problems, thawing vast bodies of snow at a faster rate than usual. 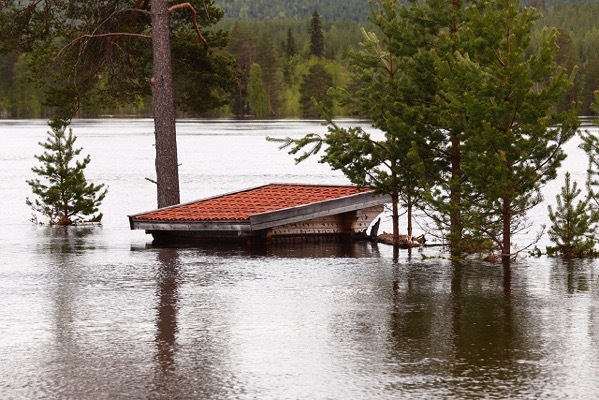 That is the case for the Vindelälven river in northern Sweden, where fast-melting snow caused the river to burst its banks and flood nearby buildings as the water level almost doubled. Photographer Grahame Soden, who captured dramatic images of the flood, described the river as a “raging torrent” for the last few days. Virginia, USA – Heavy rainfall and storms that hit Central Virginia on Tuesday afternoon have reportedly caused damage and flooded roads throughout the area. Flooding has been reported on the Midlothian Turnpike and Forest Hill and Westover Hills Boulevard. Floods in Germany, Austria, Switzerland and the Czech Republic have claimed the lives of at least eight people and left nine people missing. In Germany, flooding has claimed the lives of two people and left two more missing. 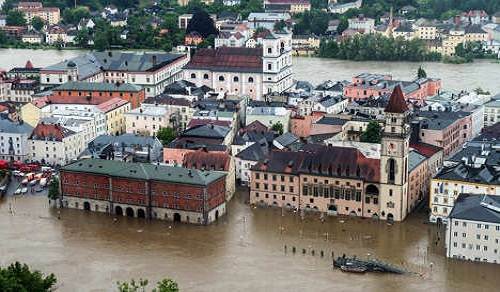 Bavaria, Thuringia and Saxony are reported to be worst hit by the floods. Train services in southern and lower Bavaria have also been disrupted. The water levels in Passua were the highest recorded since 1501. A flood emergency has been declared in seven regions of the Czech Republic. A huge storm and heavy rainfall have claimed the lives of at least 10 people and injured more than 40 others in Khyber Pakhtunkhwa (KP) region, Pakistan. The storm collapsed walls and roofs of numerous houses. Emergency disaster zones has been declared due to drought in 26 provinces of Thailand. Hundreds of thousands of trees died in the historic drought of 2012, and many more will succumb in the next few years, according to a report from Purdue University, Indiana. Indiana’s white cedar and Florida cypress trees began dying in late summer, the report says, and Alberta and Colorado blue spruce are succumbing now. About 301 million trees died in rural Texas during the 2010 – 2011 drought. The tropical glaciers in South America are melting at their fastest rate in 300 years. Glaciers in the tropical Andes have shrunk by 30-50% since the 1970s, according to a recent study. The glaciers provide fresh water for tens of millions in South America. The study included data on about half of all Andean glaciers and blamed the melting on an average temperature rise of 0.7C from 1950-1994. Glaciers are retreating everywhere in the tropical Andes, but the melting is more pronounced for small glaciers at low altitudes. Glaciers at altitudes below 5,400m have lost about 1.35m in ice thickness per year since the late 1970s, twice the rate of the larger, high-altitude glaciers. Because the maximum thickness of these small, low-altitude glaciers rarely exceeds 40 metres, with such an annual loss they will probably completely disappear within the coming decades. Water shortages: The researchers also say there was little change in the amount of rainfall in the region over the last few decades. Without changes in rainfall, the region would face water shortages in the future, the scientists say. The Santa River valley in Peru would be most affected; its hundreds of thousands of inhabitants rely heavily on glacier water for agriculture, domestic consumption, and hydropower. Large cities, such as La Paz in Bolivia, could also face problems. Glaciers provide about 15% of the La Paz water supply throughout the year, increasing to about 27% during the dry season. With the effects of global warming becoming more evident, once welcome floods in Bangladesh now bring hardship and hunger. Life on the floodplains in Bangladesh can be a perilous existence. On islands along the Brahmaputra river, in Gaibandha province, unseasonable flooding has destroyed crops, spreading hunger and poor nutrition. Changing rainfall patterns are making the floods more violent, more frequent and less predictable. After the floods, all that is left is mud. Attempts to re-sow crops are unlikely to be successful as the growing season has passed. New data from US space agency NASA has confirmed that temperatures across large parts of Australia were up to 15 degrees above average during the first eight days of 2013. The data, collected and beamed to earth from NASA’s Aqua satellite, recorded temperatures across the nation from January 1 to January 8 and compared them with the first weeks of each year between 2005 to 2012. It found that large swathes of Western Australia, South Australia, Queensland and the Northern Territory were 15 degrees above average in early 2013. Large parts of the rest of the country were also well above average. Only areas in WA’s west and northwest, including parts of the Pilbara, Gascoyne and Perth, and relatively small areas of the central NT recorded below average temperatures. With climate scientists warning that droughts are likely to become more frequent and severe as global temperatures continue to climb, a recent study led by NASA scientists shows what that could mean for the Amazon rainforest. After analyzing more than 10 years worth of satellite data collected from over the Amazon region, the researchers said rainforest damage first observed during the start of a megadrought in 2005 persisted the next several years, even as rainfall gradually rose back to average levels. But another dry period that started in 2010 may exacerbate the impacts, suggesting that the Amazon rainforests may be showing the first signs of potential large-scale degradation due to climate change. The map at the top depicts temperature anomalies, or changes, by region in 2012; it does not show absolute temperature. Reds and blues show how much warmer or cooler each area was in 2012 compared to an averaged base period from 1951–1980. For more explanation of how the analysis works, read: World of Change: Global Temperatures. Black carbon, or soot, is making a much larger contribution to global warming than previously recognised, according to research in the Journal of Geophysical Research-Atmospheres. Scientists say that particles from diesel engines and wood burning could be having twice as much warming effect as assessed in past estimates. They say it ranks second only to carbon dioxide as the most important climate-warming agent. Black carbon aerosols have been known to warm the atmosphere for many years by absorbing sunlight. They also speed the melting of ice and snow. This new study concludes the dark particles are having a warming effect approximately two thirds that of carbon dioxide, and greater than methane. Black carbon is said to be a significant source of rapid warming in the northern United States, Canada, northern Europe and northern Asia. The particles are also said to have an impact on rainfall patterns in the Asian monsoon. According to a Congress mandated study, the consequences of climate change are now hitting the United States on several fronts, including health, infrastructure, water supply, agriculture and especially more frequent severe weather. A draft of the U.S. National Climate Assessment, said observable change to the climate in the past half-century “is due primarily to human activities, predominantly the burning of fossil fuel,” and that no areas of the United States were immune to change. “Corn producers in Iowa, oyster growers in Washington State, and maple syrup producers in Vermont have observed changes in their local climate that are outside of their experience,” the report said. There had been an increase in average U.S. temperatures of about 1.5 degrees F (0.83 degree C) since 1895, when reliable national record-keeping began, more than 80 percent had occurred in the past three decades. With heat-trapping gases already in the atmosphere, temperatures could rise by a further 2 to 4 degrees F (1.1 to 2.2 degrees C) in most parts of the country over the next few decades. – warmer and more acidic oceans. Global collapse of human civilisation seems likely, writes Paul Ehrlich, president of the Center for Conservation Biology at Stanford University in the prestigious science journal, Proceedings of the Royal Society. This collapse will take the form of a gradual breakdown because famines, epidemics and resource shortages cause a disintegration of central control within nations, in concert with disruptions of trade and conflicts over increasingly scarce necessities. Already two billion people are hungry today. Food production is humanity’s biggest industry and is already being affected by climate and other environmental problems. No civilisation can avoid collapse if it fails to feed its population. Escalating climate disruption, ocean acidification, oceanic dead zones, depletion of groundwater and extinctions of plants and animals are the main drivers of the anticipated collapse. Our reality is that current overconsumption of natural resources and the resulting damage to life-sustaining services nature provides means we need another half of a planet to keeping going. And that’s if all seven billion remain at their current living standards. We’re facing a future where billions will likely die, and yet little is being done to avoid certain disaster.